Compact and durable stainless steel design makes the Westwaard pasteurizer the ideal tool for your dairy. Multiple sizes assure that you will be able to find a product that efficiently fits your calf feeding needs. 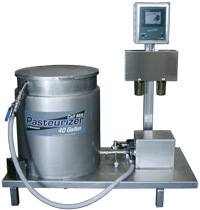 This electrically heated pasteurizer features automated pasteurization cycles easily navigated by using a large screen. An in-built pump provides easy dispensing as well as agitation during pasteurizing. Included is a re-heat and pre-cool option. This unit requires manual washing. 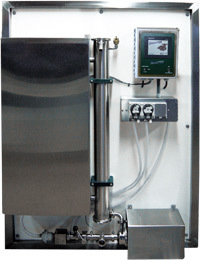 This electrically heated pasteurizer features automated pasteurization cycles easily navigated by using a large screen. 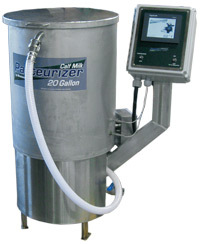 An in-built pump provides easy dispensing as well as agitation during pasteurizing. Included is a re-heat and pre-cool option. Automatic Clean in place (CIP) system makes sanitation easy and accurate with optional peristaltic chemical pump. Comes in two sizes 40 gallons or 60 gallons. This large capacity pasteurizer features automated pasteurization cycles easily navigated by using a large PLC screen. This pasteurizer requires integration with hot water heater for heating cycle. An in-built pump provides easy dispensing as well as agitation during pasteurizing. Included is a re-heat and pre-cool option. Automatic Clean in place (CIP) system makes sanitation easy and accurate with included peristaltic chemical pump.